Nothing much on the card end this month. AUTO (RC) GB1: When this Unit Boosts a Rear-guard with the Charge ability, during that battle, this Unit gains Power+3000, and if the Boosted Unit is “Jet Power, Dusty”, you can make that Unit Charging. 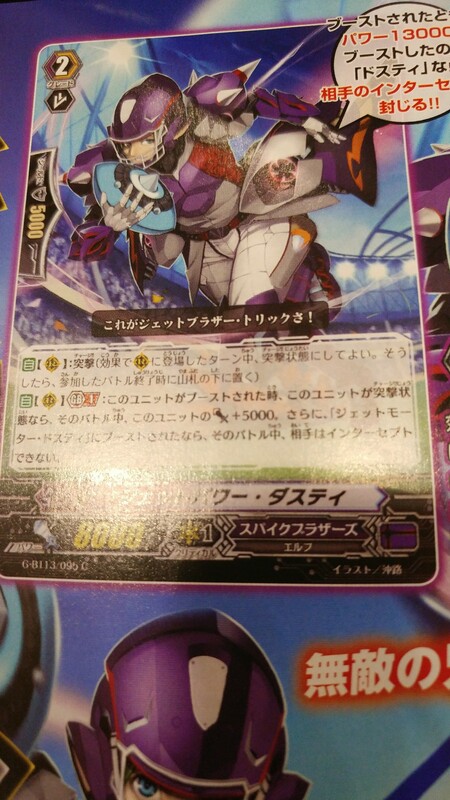 AUTO (RC) GB1: When this Unit is Boosted, if this Unit is Charging, during that battle, this Unit gains Power+5000. And if it’s being boosted by “Jet Motor, Dosty”, during that battle, your opponent cannot Intercept. Completely illegible blurry Alter Ego Neo Messiah. After the U20, the Apostles begin to make their move, and Chrono faces off against Noa, the host of Chaos Breaker. Shion faces off against Valeos. Valeos is after seizing or destroying the sacred sword Fides, and to ensure his goal he calls forth the forbidden “Zeroth Dragon”. Chrono and pals wander Relics and encounter Gastille. Meanwhile, back on Earth, Valeos takes on Taiyou, using his Zeroth Dragon. Kazuma and Kazumi attempt to try and save Chrono and pals. But, Saori stands in Kazuma’s way, burning with hatred.